The referendum is approaching and we have no idea what's waiting for Turkey. Well waiting can sometimes be a bit too overwhelming so I decided to analyse social media reactions and see what people are posting about this matter. 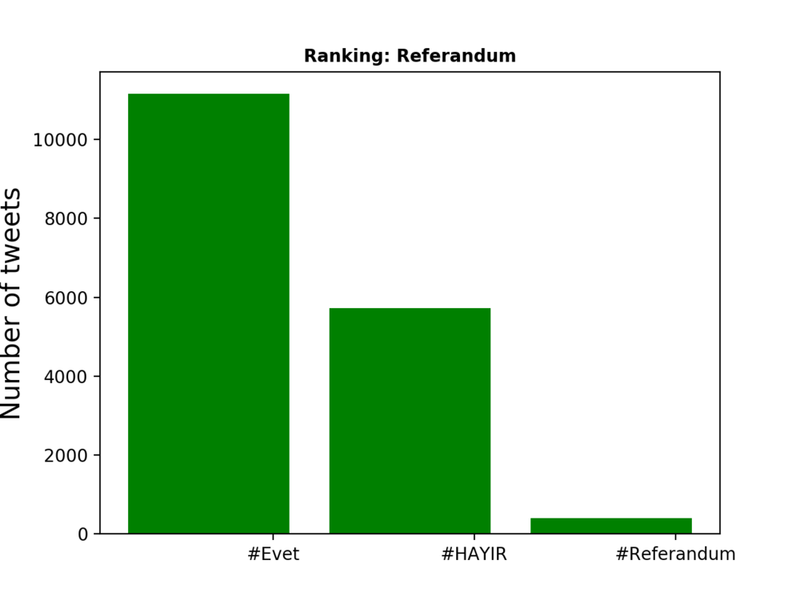 The basic idea is to analyse the most popular hashtags around this topic; #referandum #evet (YES) and #hayır (NO). Well of course we will wait until April 16th. Until then, however, I will observe the twitter feeds for 5 (or more) hours per day and share the results with you. So below is the result for April 5, 2017. I will keep updating this chart everyday. So for today we can see that the supporters of Erdoğan's one-man rule is doubling the amount of the opponent voice. We can see that people tweeted 7770 times with #yes and 3967 times with #no. How do I analyse Twitter posts? I used Python code that is openly shared here. I needed to tweak the code just a bit on parts where it didn't work for me. Then I ran the code for the three hashtags (#referandum #evet and #hayır). This code streams and saves live twitter data. The second code helps only to analyse the results. The video below will demonstrates how the data is automatically collected and analysed. I streamed six hours of Twitter data for #referandum #evet (YES) and #hayır (NO). Below you can see the resulting chart.